The case against the Domestic Partnership Act began in Supreme Court this week in front of Chief Justice Dr Ian Kawaley. Mr Pettingill said the DPA, which is scheduled to go into effect in June, discriminates against a class of people. 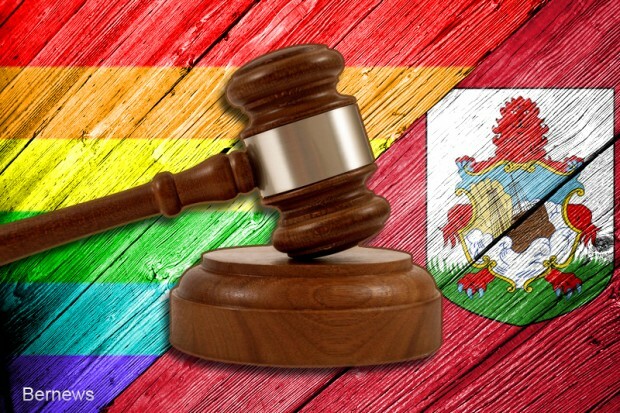 Mr Pettingill is representing Rod Ferguson, a gay Bermudian man who lives in the United States. Last year Winston Godwin and Greg DeRoche, a gay couple, won their case in Supreme Court against the Registrar-General, who refused to publish their wedding banns. After the General Election, Government passed a law barring gay people from getting married but allowing them to enter into domestic partnerships. Mr Pettingill said that gay people and right thinking people took the view and have the view that the rights of homosexuals had become full, and that they were protected to do all the things their heterosexual friends do, including the right to marry. The Chief Justice replied by saying that there is no guarantee in a democracy that the law will remain the same. There is a guarantee to have fundamental rights protected by the Constitution remain the same until the Constitution is amended. The right of Parliament to pass laws is so fundamental to our system that the courts have to exercise serious restraint when asked to challenge the legality of what Parliament has done, he added. He added this case might be argued in a completely different way at a higher court. Mr Pettingill then argued it was an inhuman and degrading treatment to deny his client the right to marry a person of whose choosing. He said there is no question that the treatment of gays under this legislation is degrading because it creates feelings of fear, anguish and inferiority. The Chief Justice suggested that a state agent would have engaged in some form of conduct which deliberately targets the individual act or a group of people. “It can surely be so wide that anybody who is distressed or humiliated by an act of Parliament is capable to complain it is inhumane and degrading treatment,” Dr Kawaley said. “That doesn’t let you go to the top floor; you have to get off here; you have to sit at the back of the bus; you can’t sit at the counter. There are analogies throughout history on discrimination. This is discriminatory. “Had it been that way from the outset, it would have been a bigger hill to climb. But it is that fact of taking away those rights. He said homosexuals are being targeted by this law. The Chief Justice said the form of discrimination as far as Freedom of Conscience is concerned is relatively narrow. “You have to be careful not to mix apples and oranges,” he said, adding that sometimes it is difficult to work out what discrimination is actually wholly or mainly attributable to belief as opposed to sexual orientation.